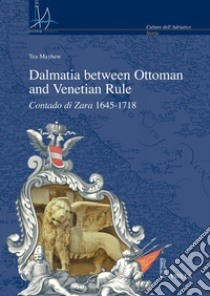 This book gives an overview of the crucial events that took place during the passage from the Ottoman to the Venetian rules in the Dalmatian hinterland during the Candian and Morean Wars in the second half of the 17th century. The hinterland of the capital city of the Venetian dual province of Dalmatia and Albania – the city of Zadar/Zara – has been used here as a case study to depict all the changes relating to: inhabitation, the appearance of settlements, changes in the populations and migrations, the forms and models of administrative and political institutions, specific border economies and the development of Venetian border areas through trade with the Ottomans alongside agriculture in the contado. Studied here is how the city of Zadar, whose life was organised as a typical coastal community like many in the Venetian Republic along with its contado, managed to enlarge its territory and incorporate elements of Ottoman political, administrative and cultural heritage along with thousands of Ottoman Christian subjects.